22mm with 6mm barbed rotating system. Used for oxygen bleed-in. You can add oxygen to your PAP therapy 2 different ways with this adapter. 1. If your PAP mask does not have an oxygen port: Connect one end of the adapter to your PAP machine and the other end to your PAP tube. Connect the smaller third opening on the adapter to your oxygen tube. 2. 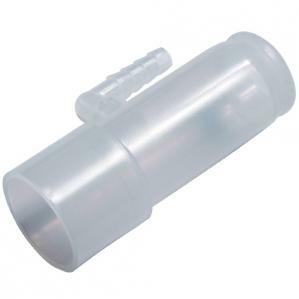 If your PAP mask does have an oxygen port: Connect one end of the adapter to your PAP mask and the other end to your PAP tube. Connect the smaller third opening on the adapter to your oxygen tube.